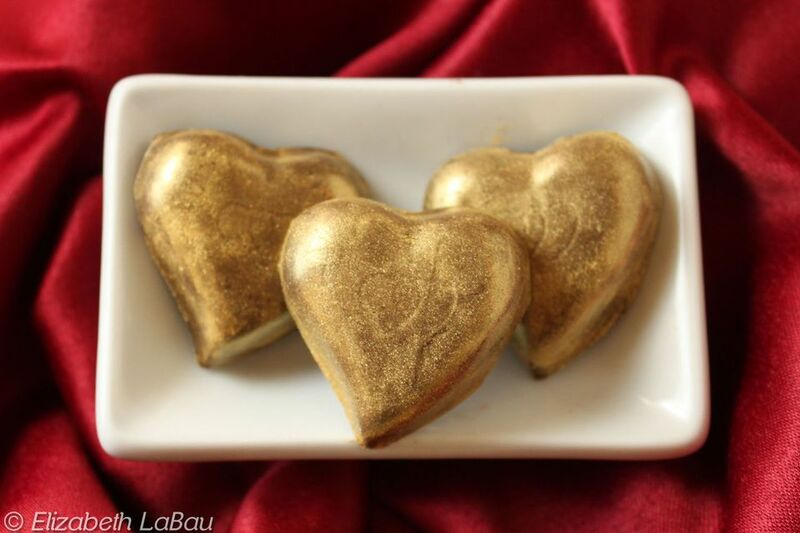 Show your love with Heart of Gold Truffles! These dazzling molded chocolate truffles sparkle with a gold coating, making them the perfect gift for Valentine's Day or any special occasion. If you want a step-by-step guide for making these spectacular candies, check out the photo tutorial showing how to make molded chocolates! For this recipe you will need heart-shaped candy molds, which can be found at cake decorating stores, candy supply stores, and many craft stores. It works best if the molds are fairly deep, at least 1/2", so that there is room for a generous amount of filling. First, prepare the ganache filling. Place the chopped bittersweet chocolate in a medium bowl, and set aside. Pour the heavy cream into a small saucepan over medium heat, and bring it to a simmer. Press a piece of cling wrap to the top of the ganache and let it sit at room temperature to cool. It is ready to use when it is no longer warm at all, but still fairly fluid. While you wait for the ganache to cool, prepare the molds. If you have only one mold, you will have to repeat this process multiple times until all of your candies are formed. If you have multiple molds, you can do this all in one batch. Melt the candy coating, or take the tempered chocolate, and spoon some into each cavity in the mold, so that the cavities are entirely filled. Wait about a minute, then flip the mold upside down over a piece of waxed paper or parchment paper. The excess chocolate will drip down onto the paper. Swirl it slightly to encourage the chocolate to drip down. The chocolate on the paper can later be scraped off and re-melted to be used again. Take a chef's knife, an offset spatula, or a bench scraper, and run it across the top of the mold, removing any excess chocolate from the top. This will make your finished truffles neater. Let the chocolate mold harden at room temperature, or if your ganache is ready to use immediately, place the mold in the refrigerator to quickly set it for about 10 minutes. Once set, spoon or pipe the ganache into your molds, filling each cavity 3/4 full. Tap the molds on the counter to release any air bubbles. Refrigerate the molds to firm up the ganache, for about 30-45 minutes. It needs to be firm enough so that when you put warm melted chocolate on top of it, it will hold its shape and not melt into the chocolate. Once the ganache is chilled and firm, re-melt the coating or re-temper the chocolate and spoon some melted chocolate on top of each cavity, spreading it to the edges so the ganache is completely sealed in. Scrape off the excess again with your knife or bench scraper. Allow the chocolates to completely set at room temperature or in the refrigerator, then turn the mold upside-down and gently tap them out of the mold. If necessary, take a sharp paring knife to trim off any jagged edges or excess chocolate. At this point, your molded chocolates are finished, but if you want to paint them gold, continue on to the next step. Take a small, clean paintbrush that has only been used for food, and dip it in the gold luster dust. Brush the dust over the entire surface of the chocolate, until it is shiny and covered in gold. From this point on, be very careful when you handle these truffles, since the gold dust will wipe off if you touch it. Use a small spatula or knife to lift them if you need to move them, and don't stack them on top of each other or the gold coating will show marks and scuffs. Heart of Gold Truffles can be stored in an airtight container in the refrigerator for up to a week. For best taste and texture, bring them to room temperature before serving.